The meaty texture of fresh shiitake mushrooms is very soft and smooth. It doesn’t take very long to be cooked through as the dried ones do. 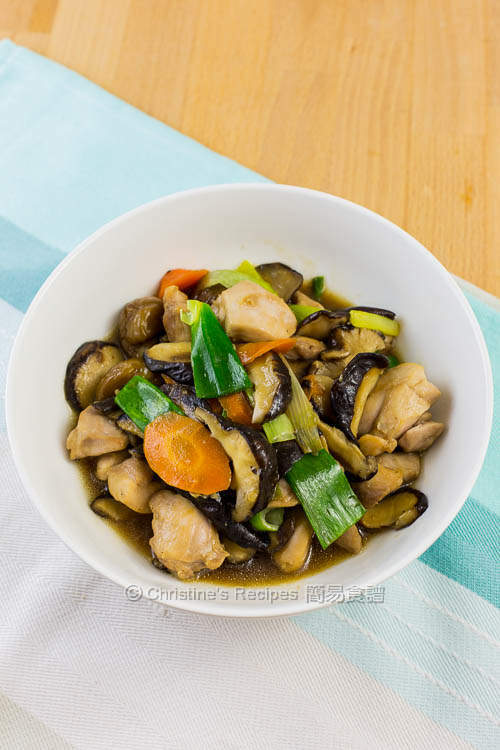 What will amaze you is that Shiitake mushrooms will take up all the flavours of the meat and sauce. This time I used mirin, one of the common staples in Japanese cooking to make the sauce, with a bit of soy sauce. The whole chicken dish turned out very flavoursome. The chicken meat was just cooked through and retained a tender texture. The highlight of the dish is the sauce that will make you don't want to waste a drop of it at all. This dish goes perfectly with a bowl of steamed rice. Cut the chicken thighs into large pieces. Mix with marinade. Set aside for 20 minutes. Thickly slice the fresh shiitake mushrooms. Heat oil in a wok over medium high heat. Saute the garlic and white parts of spring onion. Add carrot and stir to combine. 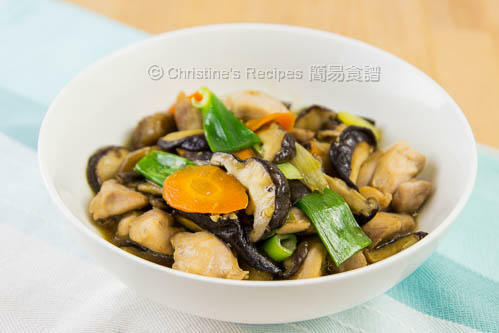 Toss in the mushrooms and cook until aromatic. Push all the ingredients to sides of the wok. Add more oil to pan fry the chicken thigh. Pour in the sauce. Cook until the sauce is reduced by half. Add the green parts of spring onion. Done. Serve hot. 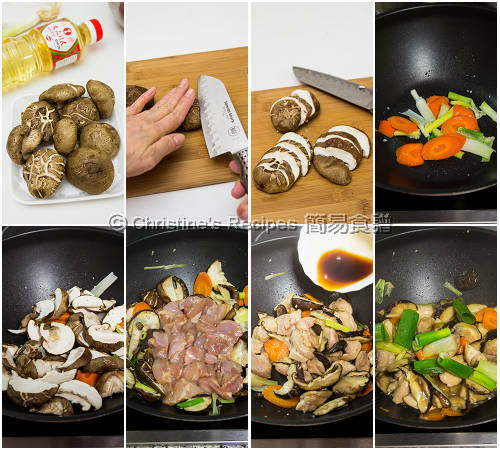 Fresh shiitake mushrooms tend to absorb more oil. You may add bit by bit of oil along the way of pan frying if you find it’s too dry. 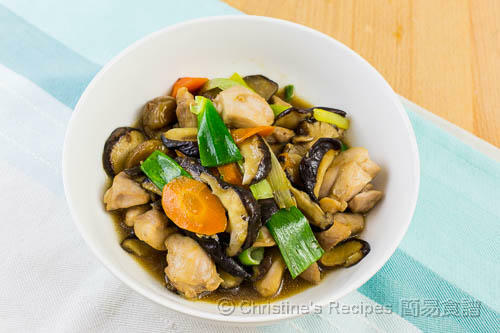 Pick the large spring onion for making this dish in order to get the best results. To juice ginger, please refer to the previous post, How to Make Ginger Juice. I surely would ask for a 2nd bowl of rice! The stirfry looks so tasty, Christine.